Food blogging, much like any other blog, is hard work. There are a ton of others out there, just like you, who want to hit it big time in the blogging lottery. Fortunately, having a standout blog is less about luck and more about your work ethic and strategy. 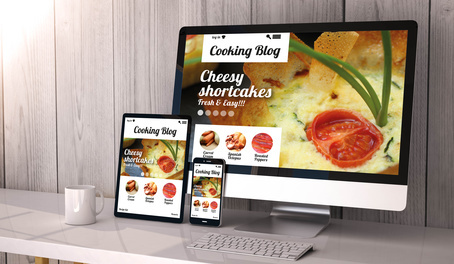 If you own a food blog and want it to thrive, follow these tips below and you’ll be much more likely to achieve success in this delicious niche. People follow other people, not blogs. The secret sauce behind any blog is the person running the show. Use your content to connect with your audience on a personal level, and you will immediately be ahead of your competition. No, I’m not just talking about fresh foods. Making your blog stand out usually means having the most interesting content possible. An SEO analysis tool can help you identify your competitors’ top performing content. Then you just have to find a way to put your own unique spin on it and make it better. One of the first things I learned about business in school was the K.I.S.S. method – keep it simple, stupid. When it comes to food blogs, simple but incredibly delicious recipes are always fan favorites. For any food blog, the most important thing that keeps your audience coming back for more is likely your recipes. Don’t lose sight of the most important thing you have to offer your audience. Make sure all of your recipes are unique and absolutely delicious. Only share your best stuff and never skimp on quality. Just because you want your blog to be the best, doesn’t mean you shouldn’t help others in your niche. By connecting with other bloggers who share your passion for food, you give yourself and them a greater chance of succeeding. Leave comments on their blog posts, share their content on social media, and pick each other’s brains. A good friend in the blogosphere almost always pays off and the returns can be heavily rewarding. Not connecting with your audience is one surefire way to go nowhere with your blog. One way you can counteract this is by simply being available for your readers. Respond to comments, answer emails, and frequently ask for their feedback. They look to you for advice as an authority in your niche, and it’s important that you help them in their own individual journey. Whether you like to admit it or not, any successful blog – food or other – is one that’s treated like a business. In order to keep and grow a readership, it’s important to post content regularly. Your audience is constantly seeking new, exciting information, and you’re leaving a lot on the table if you aren’t the one that gives it to them. Building a successful food blog is anything but easy, however, it can certainly be fun. Follow the advice above and your blog will likely be well on its way to success. Just make sure to enjoy the process and never lose your passion for great food.